Chocolate dipped banana bites is a quick snack recipe. Made of just two ingredients, this simple treat is healthy and delicious. Chocolate is a rich source of metabolism-boosting MUFAs (MonoUnsaturated Fatty Acids-MUFAs are a healthy type of fat) and bananas are the richest source of resistant starch, hence the result tends this dessert to a weight loss winner. These frozen treats don’t require a whole lot of effort and are great to keep on hand for a quick grab. In just a few minutes and with minimal ingredients (2 ingredients), anybody can have these banana bites dipped in chocolate ready to place in freezer. After a couple of minutes in the freezer, they are ready to be enjoyed. I have used the normal toothpicks for dipping easily, but any fancy skewers can be opted too. Try this fun and easy dessert that uses on-hand ingredients. These can be a best treats for kids. 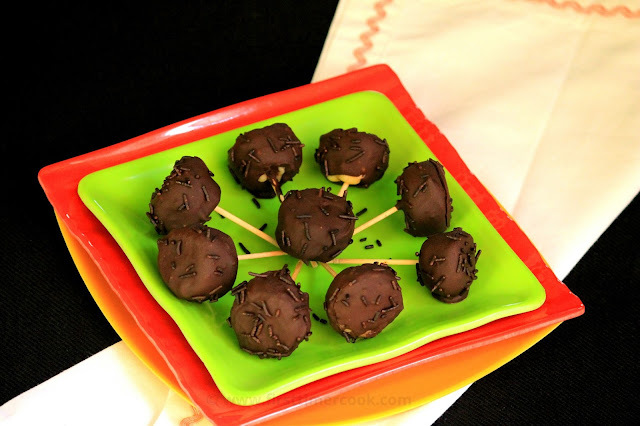 Below is the recipe for these chocolate dipped banana bites. Take a large plate and line with a butter paper, keep aside. Peel the bananas, slice into bite sizes (approximately 1 inch). Insert toothpick into each slice and arrange in a single layer on prepared plate. Freeze for 30 minutes. 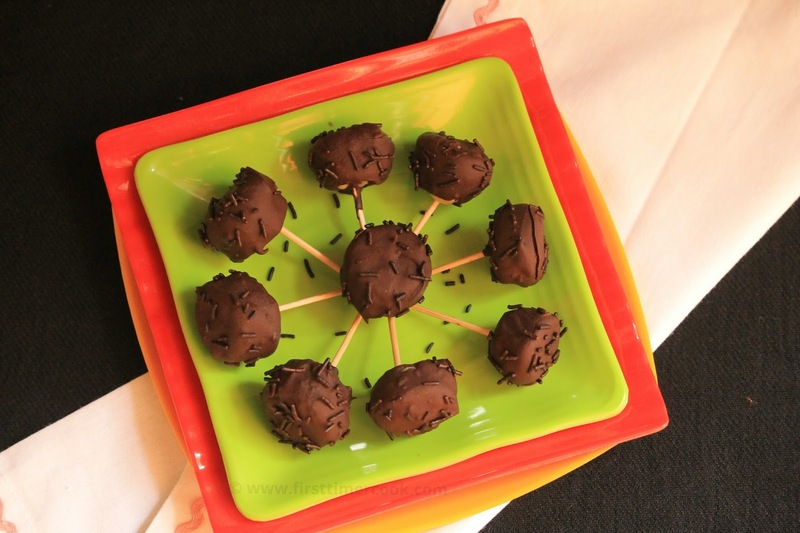 Melt dark chocolate chunks by using double boiler or just microwave for 1 - 1.5 minute. Stir in between until smooth. Take out banana slices from freezer. Dip each banana slice in melted chocolate and sprinkle some chocolate-sprinkles over the coated bananas all around. Place again on the plate lined with butter paper. Freeze the coated bananas for at least 15 minutes to set the chocolate completely. Once frozen in the freezer, then these can easily store in an freezer-safe airtight container to store for longer period. Whenever needed, take out and serve frozen ! Always leave the bananas in freezer until the moment you are ready to dip them in chocolate.